Home Tags Posts tagged with "MINDSTORMS"
Students from across the state gathered this past weekend to participate in the annual TCEA State Robotics Contest. 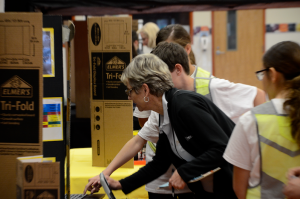 Teams had the opportunity to put their collaborative critical-thinking skills to the test as they showcased their inventions and went head-to-head with other state finalists in the Arena division. Two hundred teams of up to four students each gathered in Hutto to test their skills. Each team had already competed at the Area level against more than 1,400 teams. This year’s challenge, Mastering Mars, allowed students the opportunity to task their robots to prepare the Martian environment for human settlement and iron mining. Each team’s robot had to complete as many tasks as they could within the two-minute time frame. Teams were allowed to use one LEGO Mindstorms programmable processing unit, LEGO-branded motors and sensors, other LEGO-branded devices, and non-LEGO parts not to exceed the five dollar limit. It was impressive to see both Intermediate (grades 4-8) and Advanced (grades 9-12) state teams put their problem-solving skills to the test as they attempted to complete each task on the game field. Anticipation mixed with excitement filled the room as teams watched in awe as their robots performed. One contestant in the Arena Pit mentioned being able to test the robot’s capabilities and see what it can and can’t do as part of the thrill of competing. Overall, a great sense of teamwork, problem-solving, and creativity radiated throughout the groups. As Arena contestants battled it out for the top spot, Invention participants exercised their creative-thinking skills by designing a robot to solve a real-world problem of their own choosing. From iPotty toilet assistance for the elderly to oil pipe sealing robots, students of all ages let their imaginations run free to create exciting solutions to make the world a better place. Other solutions offered to save lives, assist entomologists to gather insect specimens, and collect dangerous metal objects, among others. In addition to providing functional prototypes of their creations, Inventions teams had to keep a detailed logbook of their progress and come up with polished presentations and marketing plans for their ideas. When asked what was their favorite part of competing at the state level, an intermediate team agreed it was the ability to create new initiatives through their inventions while being able to assist others in the process. I hope this insider’s look into this year’s competition encourages you to incorporate robotics into your classroom while allowing your students to develop their problem-solving and critical thinking skills further. If you’re interested in learning more about our program and how your students can join other robotics teams next year, click here. You might also want to check out the amazing EV3 robotics workshop TCEA is offering July 16-20. This five-day robotics workshop will show you how to use LEGO MINDSTORMS to help your students develop a love of STEM along with valuable critical thinking, problem-solving, and collaboration skills. Whether you’re an educator, librarian, or administrator, this week-long learning opportunity will give you the knowledge, resources, and best practices to introduce a successful robotics program at your school this fall. At age 88, Dr. Seymour Papert passed away this July 31, 2016. While you may or may not recognize his name, Dr. Papert had a real impact on your life and your teaching career, especially when it comes to technology in education. Here are just a few of the ways Papert’s work influences teaching and learning today. 2. Dr. Papert’s book Mindstorms: Children, Computers and Powerful Ideas (1980) has been called the “seminal work on technology and learning.” The book postulated, “technology, rather than threatening traditional education, could enhance and support the type of learning educators believed in.” 2 LEGO’s EV3 Robotics kits are named “MINDSTORMS” in honor of Papert. 5. Dr. Papert, who enjoyed boundless curiosity and intellect, was one of the cofounders of the MIT Media Lab, which, “continues to focus on the study, invention, and creative use of digital technologies to enhance the ways that people think, express, and communicate ideas, and explore new scientific frontiers.” 5 Scratch and Scratch Junior, well-know, programming software, were both developed by the people at the MIT Media Lab. Dr. Papert’s legacy is one TCEA proudly celebrates. His understanding of hands-on, minds-on learning and his early recognition of technology’s transformative potential in education laid the groundwork for the limitless possibilities and access to information now afforded to students around the world. While he will be sorely missed, his endowment will live on. 1. Harel, Idit, and Seymour Papert. Constructionism Research Reports and Essays: 1985-1990. Norwood, NJ: Ablex, 1991. Print. 2. Rifkin, Glenn. (2016, August 1). Seymour Papert, 88, Dies; Saw Education’s Future in Computers. New York Times, A21. 3.Harel, Idit, and Seymour Papert. Constructionism Research Reports and Essays: 1985-1990. Norwood, NJ: Ablex, 1991. Print. 4. “In Memory: Seymour Papert.” MIT Media Lab, 1 Aug. 2016. Web. 1 Aug. 2016. 5. “MIT Medi Lab FAQs.” MIT Media Lab, n.d. Web. 6. “In Memory: Seymour Papert.” MIT Media Lab, 1 Aug. 2016. Web. 1 Aug. 2016. What can I say? When I get to train educators about robotics, life is always good! I am so excited to be facilitating a hands-on workshop called Build and Program a LEGO Robot on Sunday morning, June 26 from 8:30 to 11:30 a.m. in Denver, Colorado. I cannot think of a better way to kick off ISTE 2016. The only way to learn robotics is to do it! Participants will spend the entire three hours of the workshop building and programming a MINDSTORMS EV3 robot. Built into the training will be classroom activities and management tips that will make the robotics program run smoothly. If you are subject to acute mountain sickness (aka altitude sickness) or won’t be able to make it to ISTE this summer, consider coming to Austin instead in the fall for a learner-driven workshop designed to give you hands-on, minds-on experience with EV3 robotics. Save the date, September 15-16, 2016 on your calendar. Whether you are a novice or experienced educator, this workshop will build your engineering knowledge and skills, establishing a solid foundation in building and programming. Additional topics that will be covered include on-brick programing, classroom management techniques, and EV3 sensor activities which can be modified to fit any grade level. Register here for the fall workshop. And look for me at #ISTE2016 this summer! Available under the first section, Teacher’s Information, is a 17-page PDF that gives you a rundown of EV3 in the classroom. Topics include How Do I Get Started?, Classroom Management Tips, and Suggested Lesson Planning Routes. My favorite part in this section is the explanation of the Robot Educator. The Robot Educator has always been the hidden gem of both EV3 and NXT software. This jewel contains 48 tutorials which, through building and programming activities, guide and support teachers and students from basic to more advanced skills. As an added bonus, the tutorials are divided into lesson planning routes through the STEM subjects. Next up is the Lesson Plan section with two main topics: lesson plans and rubrics. The Introduction to Robotics Lesson Plan has seven lesson plans, two master challenges, and four design brief challenges. Each lesson includes the build, programming examples, challenge design, and discussion questions. If you are looking for a student self-reflection form or teacher assessment for the lesson plans and master challenges, check out the matching rubrics PDF. The third section, Assessment, is, surprisingly, all about creativity. Several behavioral indicators are covered and creativity self-report templates have been created for grades K-2, 3-5, and 6-8. Scientific research by Dr. Mark Runco provides the foundation for all of the procedure and concepts described in this section. My first impression was “Why include a whole piece on creativity?” But it is definitely worth the read and can be used outside of robotics in other subject areas where creativity and innovation comes into play. Part 4 is the Element Survey. This section gives you easy access to the Language of LEGO (names of the LEGO pieces and parts). You can also find the five-page list of LEGO elements in the User Guide. Hold the fort or in this case, hold the robot! THE BEST NEWS is LEGO has taken away the price tag for these curriculum pieces. You can download each one here for free. In order to use these, the LEGO MINDSTORMS Education EV3 software must be installed on your computer. These resources focus on students aged 10-16 with links to national curriculum standards. Includes student-ready resources, full teacher support, assessment tools, sample programs, and building instructions.